Home / Unlabelled / Faux pas? the recent Super Bowl featured our much maligned Arizona Cardinals (yep) versus some team from Pennsylvania. Now, on the evening before the big game, the XYL and I were invited to the Captain’s place to enjoy this historic event and wallow in the warmth and wonder of family and friends. We enjoyed fine food and drink and the camaraderie that only those who share a common goal can appreciate. So, after the fiercely fought contest, and the wallowing I mentioned earlier, we went home to our rockers and Geritol (Google it). While driving home, a tiny nodule of concern began to gnaw at me. At the time I just couldn't put my finger on it. A week or so later, while enjoying a beverage, it hit me like the Mighty Hammer of Thor!! We were at a Super Bowl party to enjoy the Cardinals, and yet here we were drinking our liquids out of common everyday paper cups and the like! Well, if you look at the photo below, you will see Arizona Cardinal plastic glasses!!! Guess who failed to utilize said cups? That’s right; HIM. I know he has them because I saw them as I was going thru his cabinets. And I also know because his littlest brother (Yeti, Manatee, Whitey, etc.) GAVE cups to ALL of us! 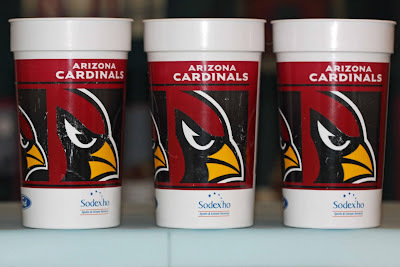 I can only hope that the next time the Cardinals play in the Super Bowl, he will furnish the appropriate containers for our beverages. Such a good point.. I am now disappointed! Hopefully it hasn't been gnawing at you since then though! Oh yeah. That's so very true. If only Lil Sasquatch had given us the right cups! !